My Dad used to tell me that quote all the time when I was growing up. I always thought it was an exaggeration, until I became a reader. Now I believe it with all of my heart. Over the past few weeks, I’ve been thinking a lot about my book choices. If you know me at all, you know that I love to read. I try to at least read 1 book/month: I call it “12 in 12” on my goals, and this year I upped it to “15 in 12.” I have 3 Pinterest Boards dedicated to books that I recommend: 1. Life + Faith, 2. Business, 3. Enjoyment. I also tag my books with #nancyrayreads on Instagram, which has been a really fun way to share what I’m currently reading! So yes, I’m a reader. I absolutely love books, and believe that 1 good book can change your life forever. It’s really a simple philosophy! And it works for me. I know it may not work for you, but I’ve acheived a lot of success when abiding by these 4 guidelines. My husband would disagree with #4 – he loves to read several books at once. I, however, am not a multitasker like he is! I like to read 1 book at a time. The point is – do what works for you. This year, I am basing my book choices on the Life Balance Wheel. 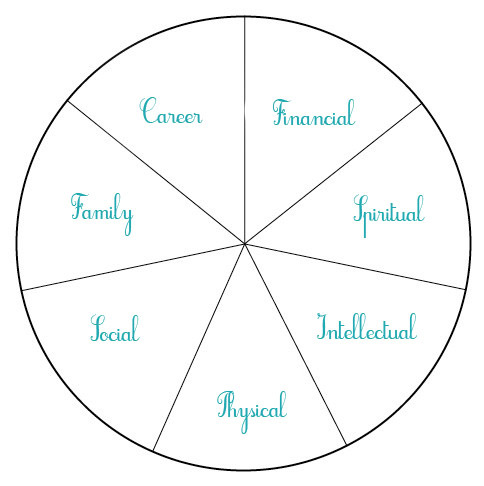 (Note: There are several versions of the Life Balance Wheel, but I like Zig Ziglar’s Wheel of Life best.) This way, I can make sure I am reading books to enhance each major category of my life. I believe that a well balanced life is a happy life, and that is what I strive for even in my readings. 1. There is an uneven number of books in each category. That’s because I just keep adding to my list of books I want to read, and when I find a new one I place them in the appropriate category. I might not get to all of the listed books in 2013, but I will roll them over to 2014 if needed. 2. Some are marked with an asterisk (*). Those mark the books I have already read this year. 3. There are more categories than listed in the Wheel of Life. That’s because I have split some of the categories into two, in order to create more specific categories to accurately reflect my life. I hope this helped you! I encourage you… no, I implore you! Become a reader if you’re not one already. It takes a little self discipline, and it pays off greatly. Please leave a comment with any books you recommend that I add to my list! I would love to hear from you! I’m currently reading Jon Acuff’s new book, Start, and it’s awesome! I would definitely recommend it for the career category, although you are already pretty full there! Hey, Nance-pants! I’m SO EXCITED you posted your 2013 book list and reading thoughts. If you haven’t already, read The History of Love by Nicole Krauss – I can’t even begin to tell you why. I’m trying to keep a running list of my own on my Avelist account (http://avelist.com/ind6957) if you’re interested!! Hope you’re well!! Hey Nancy, we met while camping a few weeks ago, and I promised to leave a comment, so here it is! I am an avid reader too, and by avid I mean, my boys have had to fetch clean socks from the laundry basket because I was too engrossed in a book to fold the laundry! I am definitely trying to balance reading helpful, spiritual, based books with pure enjoyment ones. Do you ever keep track of your books through an online site like Good Reads? I really love this idea, Nancy, of making sure you’re reading books that make you well-rounded and touch on the different aspects of your life. I’m definitely adopting this approach! I finally finished reading 7 after putting it down for a few months–such an incredible book. I always suggest any book by Anne Lamott, especially her newest Help, Thanks, Wow (such a fast read and so inspiring). I have so many books on marriage but one of my favorites is Committed by Elizabeth Gilbert. And a really great business book I read awhile ago was The E Myth. I still find myself using some of the strategies listed in there. 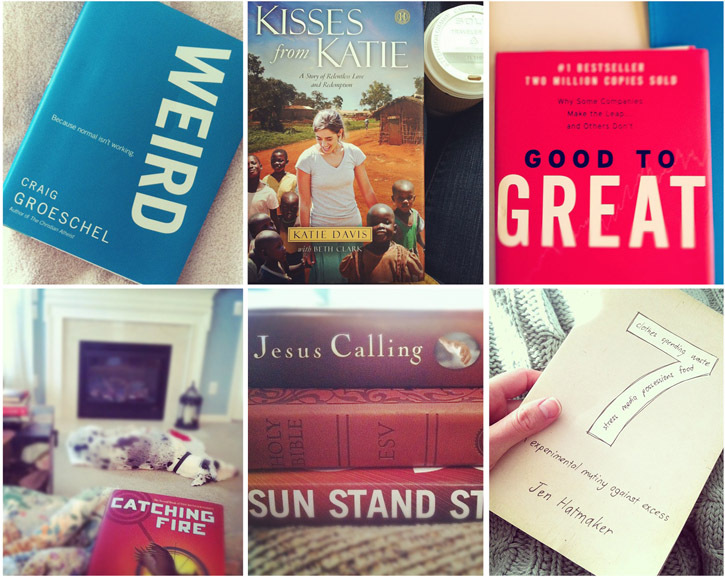 Thanks for sharing your 2013 list with us! Hi Nancy – as an English Lit major, I stopped reading after graduating from college – too many tutorials, no writing/reading for pleasure and a lot of analytics!! Just started consistently again and some on your recommendation I find reading on the subway is a good time to get through some chapters. One good book I read recently is Lucky Girl by Mel-Ling Hopgood, which details her reconnection with her Taiwanese family after being adopted from there by a Western family. Another one is called The Girls Who Went Away, about forced adoption in the 60’s and that I could not put down for ages!! I tend to like books with a social justice or real life component Sometimes I wish I liked fiction as much as some people do! That’s great that you make it such a priority.